Sorry to interrupt the travelogue, but I think we all need a food-tastic interlude. One of the important things that happened to me during the trip was that I learned to love myself. I know that sounds like a big concept or a strange answer to “what did you do this summer,” but more than anything, the trip gave me a chance to slow down, think about a lot of things going on in my life, and reprioritize what’s important to me. Part of that reprioritizing meant remembering what’s almost the most important thing in my life: cooking. Ok, you’re thinking, that’s a no-brainer, after all, this is a food blog. You might have noticed though, that I wasn’t updating so much this summer, that I was fairly absent in the blog world, only managing to pop into you all’s blogs every now and then. It wasn’t because I wasn’t a full-fledged vegan. It was because cooking for a living took over my life. I quit exercising. I quit cooking for myself (no, pasta does not count). I couldn’t sleep at night. I took it all far too personal. And that’s not going to happen anymore. I didn’t quit my job–in fact, I’m fully immersed in it these days. We’re looking forward to opening up our kitchen (fully certified now!) for private lunches & catering events, and we’ll be open on Saturdays after market ends on October 30, selling local meats, our trout, local cheese, local produce, and my prepared products. It’s exciting, it’s a lot to think about, and I’m not letting it take over my life. I’m swimming again at the YMCA, I’ve reorganized my schedule to set hours (manageable hours), I’m focusing on traveling (Philly in two weeks! ), and I’m cooking and baking again in my own cabin. With some patty pan squash in the fridge beggging to be used in something besides pasta (too. much. pasta. this summer) and three overripe bananas sitting in my fruit bowl, I got to thinking about a sweet bread, one incorporating lots of locally milled grain, bananas, squash, and chocolate (everything needs chocolate). After checking to see if anyone else had made a patty pan bread, I armed myself with the produce and Metal Vegan’s recipe and set to work at the mixer to see what would happen. I’m not going to lie and say that the recipe was a rip-roaring success. In fact, it was a humbling afternoon and one that reminded me that practice makes perfect, not just love and well wishes. With tweaking the recipe totally works, but as a first-go it was far too moist (the combo of bananas & squash became extremely wet in the oven). However, the taste rocked my world! I’m a huge fan of chunking bakers chocolate into cookies & breads instead of using chocolate chips, and in this case, the bigger the chunks the better since they kept their shape in the batter. 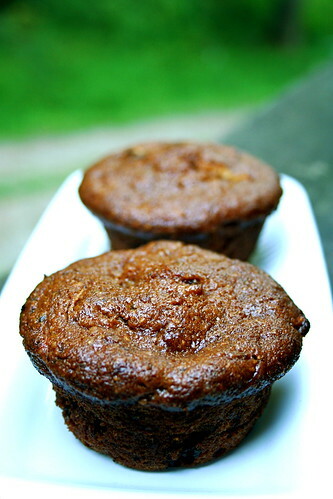 The squash & bananas, though hard to work with the oven, lended a pleasant moistness to the muffins, and I love the super spiciness to them–they’re the perfect interlude between high summer and early fall. So was it my perfect back-to-the-kitchen dream? No, but it’s good to be back! In a small bowl, whisk the apple cider vinegar into the soy milk and let sit for 10 minutes to curdle. Meanwhile, in a large mixing bowl, combine the bananas, sugars, oil, and vanilla. Add the soy milk. Slowly mix in the flours, baking powder, baking soda, salt, and spices until a thick batter forms. Stir in the squash and chocolate. Line muffin tins with paper or spray with oil. Spoon the batter into the tins and bake for 20-30 minutes, until golden brown, and when an inserted toothpick comes out clean. Let cool for 20 minutes, then enjoy! Makes 2 dozen medium-sized muffins. I’m glad to hear you’re back! It’s so easy to let work take over, especially when you love your work! I’ve had to do some reprioritizing, too. I’m particularly fond of extra-moist sweet breads (especially with big chunks of chocolate!) so I think I would have loved your muffins. Welcome back to the joy of cooking! I enjoyed reading about your trip. The llama poodle made me laugh out loud. They certainly look and sound like a wonderful success to me! Can’t beat chocolate chip banana bread when it comes to easy, comforting baked goods. The squash is an extra bonus, if you ask me. The muffins look and sound delicious. I sort of got back to the kitchen this weekend after a kind of hiatus as well, and ran into a similar situation with disappointing tofu – but trust me, your muffins look much better than my tofu did. Jes, these sound great to me! And I’m so glad you left that last comment on my blog because it made me realize (how did this happen??) that some time in the last few months your new blog got removed from my Google Reader! Will correct that oversight IMMEDIATELY. Now I must go back and read everything I’ve missed! I was too much of an expert haha. It was quite a bit of a mess in this house, both literally and figuratively, for a good week. All’s back together and healthy now, despite a few sniffles. Glad to hear you dig the sandwich Thank you. I love how glossy the tops are! Mmmm, big chunks of chocolate are my favorite. I have never had patty pan squash, but just the name alone makes me want to try them. Patty Pan Pan. Pat Patty Pat Pat. 1/2 c vegetable oil in the ingredient list but I don’t see it in the instructions, except as an option to spray the muffin tins. of course, I didn’t realize that until I’d already stuck em in the oven. They are very tasty and plenty moist without the veg oil. I couldn’t find rye flour so I used 3 cups gold n white + 1/2 c wheat bran. Yum!! !